sam's been introduced to carrots this week. he seems to like them. 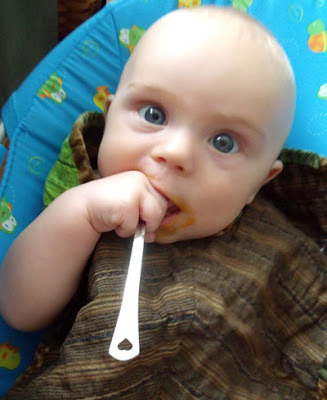 he also seems to like the idea of feeding himself (or chewing on the spoon). he's wearing the best bib from aunt missy. it's nice and long and covers most of his body AND it's shades of dark brown on one side, so it doesn't really show the food that misses the mark (or gets spit back out). we use that bib on most occasions these days. thanks aunt missy! yay! i'm so glad the bib is getting lots of use! hopefully he'll be using it for a long time to come (instead of refusing and ripping it off). oscar still wears bibs good.. in fact, if you forget to put one on him he'll usually remind you.